I'm being utterly ridiculous, because : a) I'm not much of a Tory Burch fan (too much logo), and b) I don't need another super casual summer tote. 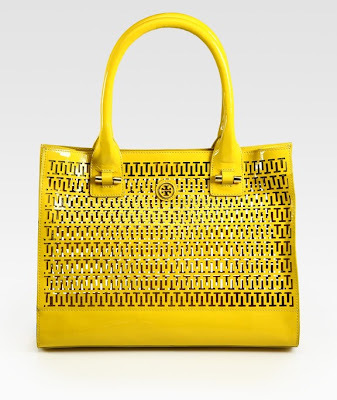 But I'm in a summer vacation mode and this Tory Burch Georgiana Patent Leather Tote in bright sunny yellow is, well, a vacation in a handbag. It looks fun and pairs well with a sun dress and ballet flats. $495 at Saks and other similar places.